The much talked about film, Gippy Grewal and Simi Chahal starrer, ManjeBistre 2 is nearing its release. And one must admit that throughout time, the makers of this film have, successfully, managed to hook the audiences across the globe, and make them yearn for the release of this film. So far, we have been able to witness some foot-tapping tracks and romantic tracks as well. This film seems to be a cocktail of all sorts of elements which simply makes you want more and more of it. Where the film’s songs make you dance and romance, the short snippets from the trailer leave you in splits. 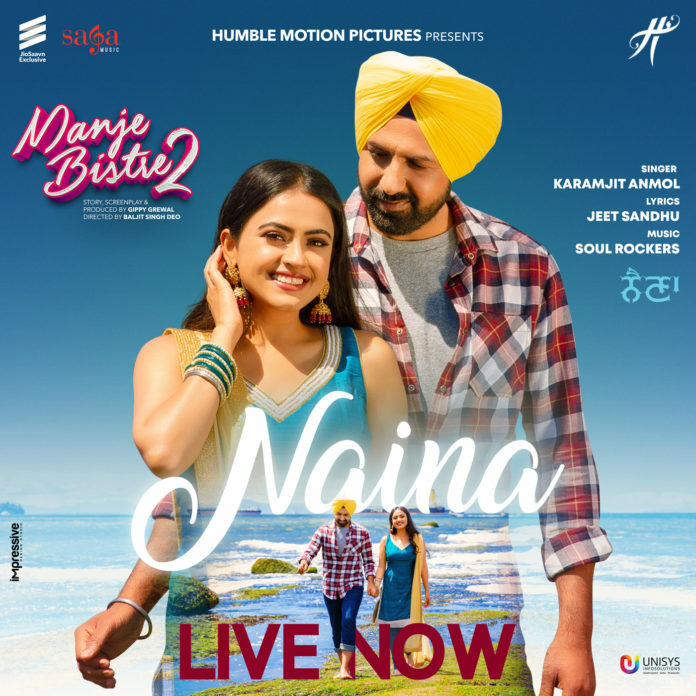 The film’s makers have, today, released yet another soulful track titled ‘Naina’; and it is out and out romantic, full of love, and truly personifies that feeling of love when one gains comfort in the silence. After this song one shall start believing “When there are no words, let the eyes do the talking”. The song has been crooned by none other than Karamjit Anmol. He is a popular actor in the Punjabi film industry, and this versatile personality has nailed varied various characters through his class apart acting skills. Not only acting, Karamjit Anmol, has a voice of gold and he has given the soul to this heart-touching track. This song has been released by Saga Music. It has been penned by Jeet Sandhu, and the music is given by Soul Rockers. ManjeBistre 2 is the second franchise of the blockbuster film ManjeBistre which was released in April 2017. Expectations are mounting, and are positive that this sequel is going to make people laugh harder. It is produced by Gippy Grewal, under his home production Humble Motion Pictures. Directed by Baljit Singh Deo, ManjeBistre 2 is going to hit the silver screens on the 12th of April, 2019.